We are seeking observers to learn about the flowering timing of nectar sources for monarchs and other pollinators! Pollinators are an essential part of our environment - they ensure the reproduction of 85% of the world's flowering plants, and over two-thirds of our crop species. Many threats, including habitat loss and use of pesticides, threaten these pollinators. One of the best-known butterlfies in North America is the monarch butterfly. Monarchs are renowned for their complex life cycle, which takes them on the longest-known migration distance for insects. Due to this complex, long-distance migration, the dietary needs of monarchs are complex. The nectar that they rely on to fuel their flight comes from a diverse suite of flowering species that occur across a large geographic area. Changes to these food sources, through habitat loss, pesticide use, or climate change, can be costly to monarch populations, as well as to the many other pollinators that rely on these same species for their dietary needs. See what we learned from this campaign in 2018. You can learn about these important nectar sources for monarchs and other pollinators by observing flowering of nectar plants in your own backyard, a nearby park, or other location you frequent! 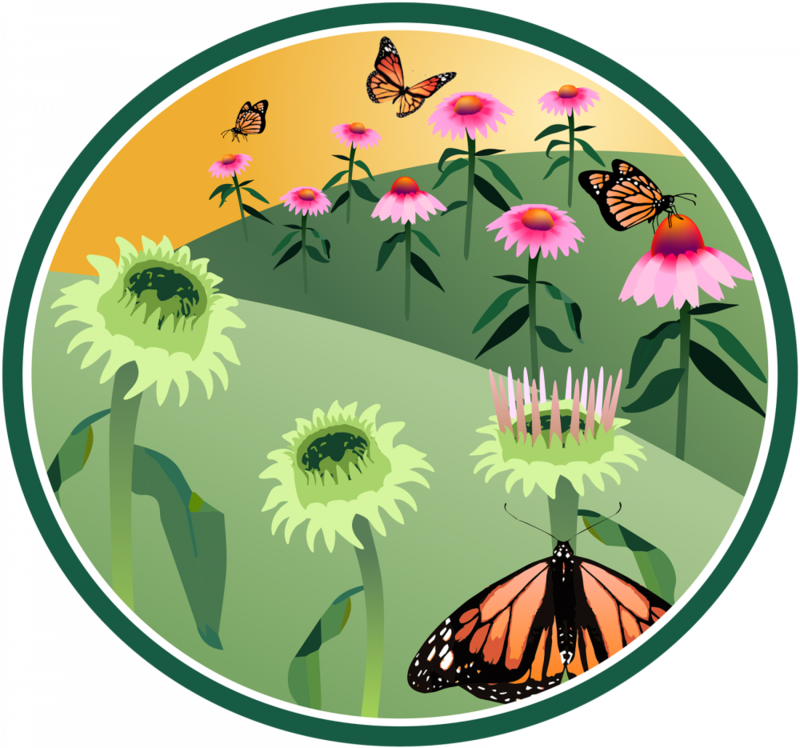 Your reports will help resource managers like the US Fish and Wildlife Service to better understand where and when nectar sources are available for monarchs and other pollinators across the United States so that they can take necessary steps to conserve and promote habitat for these pollinators. See the full list of species by searching The Plants and Animals page, filtering for the Nectar Connectors Campaign under Plant Type. 1. Select one (or more) species to track from the list of species. To see which species are available in your state, go to The Plants and Animals page, and filter for your state and Nectar Connectors Campaign (under Plant Type). 3. Sign up to receive our Nectar Connectors campaign messaging (in the right sidebar of this page - you may need to scroll back up to see it). You will receive messages approximately every 4-6 weeks during the growing season, providing early results, encouragement, observation tips, interesting links, and campaign-specific opportunities. Don't miss out! 4. Take observations. We invite you to track leaf out in your plants ideally 2-4 times a week in the summer and fall when plants are flowering. We are especially interested in flowering phenophases, though you are welcome to report on leafing and fruiting as well. Download a handout about the Nectar Connectors Campaign. In 2018, 285 observers reported on Nectar Connectors species, up from 206 last year. These observers submitted data at 195 sites, up from 135 last year. 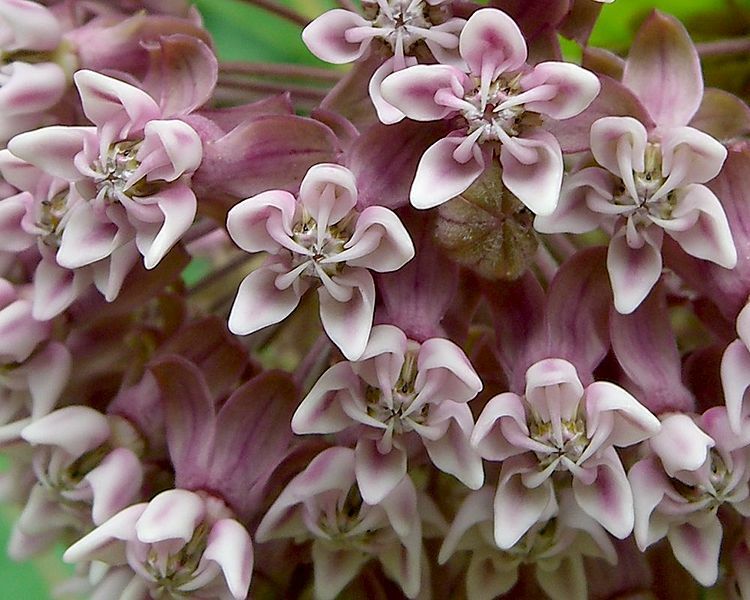 The most observed species were common milkweed (Asclepias syriaca), butterfly milkweed (Asclepias tuberosa), and eastern purple cone flower (Echinacea purpurea). The map below indicates the sites where you reported on Nectar Connector species this year. 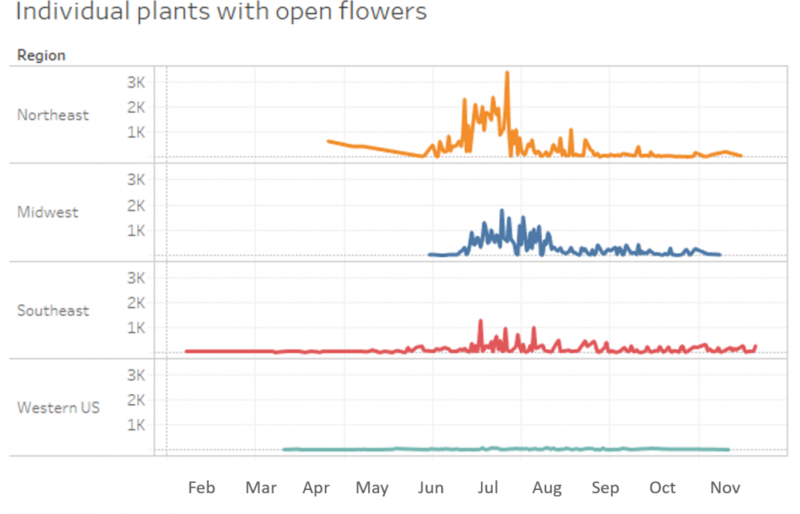 The colors of the dots indicate when the average first date of open flowers was reported at that site, with earlier dates in blue and later dates in orange. In the Midwest and Northeast, onset of flowering generally occurred in the summer months. In the Southeast and Western United States, onset of flowering occurred in both the early spring and late fall. This may reflect the combination of spring, summer, and fall flowering plants in these regions that are essential for monarchs during migration. The number of individual plants with open flowers generally followed a similar pattern for the Northeast and Midwest, with a larger number of plants flowering in the summer months. This pattern was more pronounced this year than last year. Flowering in the Southeast and Western US had a less pronounced peak, which may be due to the composition of species that typically flower in different seasons, or the length of the growing season in these regions. Many observers answer a secondary question about the intensity to which the phenophase occurred on their individual plants. For the open flowers phenophase, this is the percent of flowers that are open. Just like last year, the peak in the number of plants with 95% or more flowers open occurred in July for the Northeast, Midwest, and Southeast this year. For the Western United States, there was no obvious peak, much like last year. This pattern may reflect growing season length, as we see the strongest peak in July in the two regions which have the strongest seasonality - the Midwest and Northeast. What does this mean for monarchs? In the Eastern United States, monarchs migrate north from Mexico in the spring, and subsequent generations eventually reach the northern United States and Canada in the summer. Monarchs then make their migration back south in the late summer and fall. The Western population follows a distinct migration pattern and generally winters in coastal California. As we found last year, your reports indicate that generally flowers were available for monarchs at locations along their migration route at the time monarchs would need them in a typical year. As we see more unusual seasonal climate such as early springs and late autumns, your data will help us to better understand the subtle changes in the timing of flowering from year to year. This will help us to know how nectar sources are shifting, and whether sufficient flowers are available where and when monarchs and other pollinators need them the most. You can earn this badge by observing one target Nectar Connectors species in six separate weeks, within the same year.